Recorded/performed at: Michigan State University, USA Barry Conyngham Verdehr Trio 13 mins, 53 sec. Recorded/performed at: Michigan State University, USA Douglas Knehans Verdehr Trio 11 mins, 56 sec. Recorded/performed at: Michigan State University, USA Richard Mills Verdehr Trio 10 mins, 50 sec. Recorded/performed at: Michigan State University, USA Peter Sculthorpe Verdehr Trio 15 mins, 11 sec. Also includes: Three aspects of spring / Christopher Marshall. Includes biographical information about the composers. Includes programme notes written by the composers. Score: Baltimore songlines : for clarinet, violin & piano / Peter Sculthorpe. 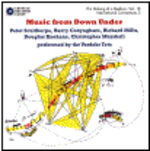 Parts: Baltimore songlines : for clarinet, violin and piano / Peter Sculthorpe. Score: rive : for clarinet, violin and piano / Douglas Knehans. Parts: rive : for clarinet, violin and piano / Douglas Knehans.